‘Abd Rabbuh Manṣūr Hādī (Arabic: عبد ربه منصور هادي [ʕæbd ˈrɑbːʊh mɑnˈsˤuːr ˈhæːdiː]; born 1 September 1945) is a Yemeni major general and politician. 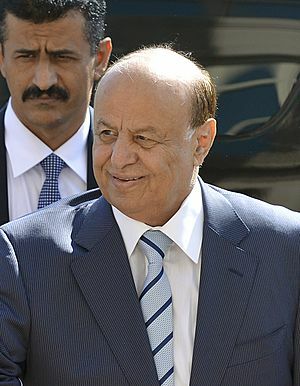 He was the President of Yemen from 27 February 2012 until 22 January 2015. In January 2015, he resigned after the Houthis seized the Republican palace. He was previously the Vice President from 1994 to 2012. 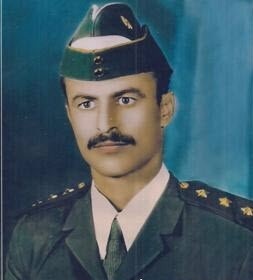 Between 4 June and 23 September 2011, he was the acting President of Yemen while Ali Abdullah Saleh was undergoing medical treatment in Saudi Arabia following an attack on the presidential palace during the 2011 Yemeni uprising. Abd Rabbuh Mansur Hadi Facts for Kids. Kiddle Encyclopedia.